This announcement has 19 photos to see all the details of the whole, do not hesitate to go to the end, it ends with the word end. To stop the music right click on this button. The flea market of detector0_0. (choice of auction items or immediate purchase). Add to my favorite shops. Thank you to look carefully at the photos and the amount of shipping costs. Feel free to request additional information. Master's work signed g. And his 6 glasses ciboure rf. Suspended on each side (wooden cup holders). Waterproof, 1 liter capacity, the tap works. Detail of the signature on the barrel. Detail of the signature under the glasses. Detail of the wooden faucet. Detail of the barrel separated from its support. The 6 glasses Basque with handles ciboure rf. Height varies between 4.2 and 4.5 cm, high diameter 4.2 cm, bottom 3 cm. Characters and houses varied, varying patinas. One side with 3 glasses with Basque grandfather decor (aïtatxi) and one side with 3 glasses with Basque grandmother decor (amatxi). Detail of the glasses "to the grandfather". Two-sided interior and bottom, one of them presents a tiny égrenure (shot of the bottom). Detail of the glasses "to the grandmother". Detail of the back (oval of the barrel 14 cm on 9 cm). Total height 22 cm, length 19 cm, width of the whole 21 cm. Read the conditions of receipt within 48 hours in the section below payment instructions. Put your items on sale quickly and easily, and manage your ads in progress. 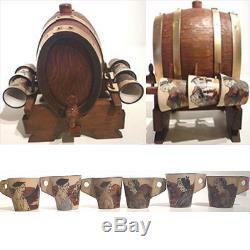 The item "Alcohol barrel wood G Lafitte mof & 6 glass ciboure rf b" is on sale since Friday, January 30, 2009. It is in the category "art, antiques \ objects of the twentieth, recent". The seller is "detector0_0" and is located in / bordeaux aquitaine. This item can be delivered anywhere in the world.